With the use of Jerry's spotting scope we were able to enjoy some of the sitings up close and personal. Visually identified species included turkey, mourning dove, crow, phoebe, wood duck, mallard, savannah sparrow, chipping sparrow, song sparrow, swamp sparrow, red-winged blackbird, robin, blue jay, chickadee, cliff swallow, barn swallow, tree swallow, rough-winged swallow, goldfinch, turkey vulture, osprey. Identified by voice only were hermit thrush, blue-headed vireo, white-throated sparrow, yellow-rumped warbler, ruffed grouse, raven, Canada goose and hermit thrush. 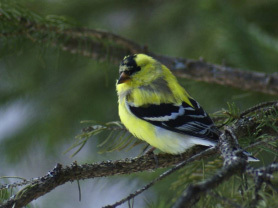 May 5, 2012 8:00 a.m to 10:00 a.m.
Take a walk on a bird rich farm with bird enthusiast Jerry Smith, and members of Holden Land Trust. We will gather at the Holden Town Office at 7:45 a.m. and we will car pool to the Howard Farm on the Rowell Road in Holden. 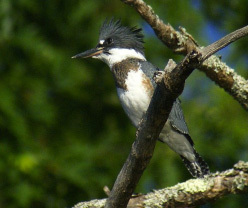 At the farm we will be guided by knowledgeable bird expert Jerry Smith, with the expectation of seeing the many distinct and unique birds that make Holden their home. 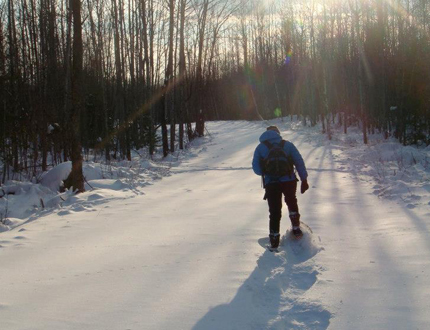 Lack of snow prevented the Land Trust for hosting our traditional winter ski and snowshoe event, so we took this as an opportunity to present something new. The community was invited to the Fields Pond Audubon Center in Holden to visit “Other Lands” through picture presentations of places that members and friends of the Land Trust had visited in the past year, with or without snow! The presentation began in Maine with Inlanad Fisheries and Wildlife Research Biologist Randy Cross. Randy and his colleagues have been engaged in research project for more than 20 years to identify and monitor the Black Bear population in several areas of the State. We went up close with Randy into a variety of bear dens, in ground, below ground and above ground during the course of multiple winters. It gave us all new insights both into the bears and into the educational and conservation programs of IFW. From bear dens in Maine we travelled to the majestic and beautiful Grand Canyon. John Bryant shared his exciting week long rafting trip, taking us into the Canyon and down the Colorado River. We could almost feel the feel the sand in our shoes as we watched the setting up of camp along the river, and feel the spray from the mighty riveriver as they navigated the many heartstopping rapids. Next it was north to Alaska, where Kevin and Carol Cuddy documented the ceremonial beginning of the ‘last great race on earth’, the Iditarod. We watched more than forty entrants to the race begin their arduous trek, with the Cuddys’ pictures of the dogs, sleds and mushers left downtown Anchorage for the ceremonial start of the great race. The Cuddys’ anecdotes and images were breathtaking. The last visit of the day was to Ghana, where Betty Jamison and Kris Reid shared their summer visit, working with the children of a local orphanage. The two hour virtual tour confirmed our endless appreciation of “Other Lands”, and renewed our dedication to protecting our own local lands. The Land Trust gives special thanks to Fields Pond Audubon Center for allowing us to use their excellent facilities for the visit.